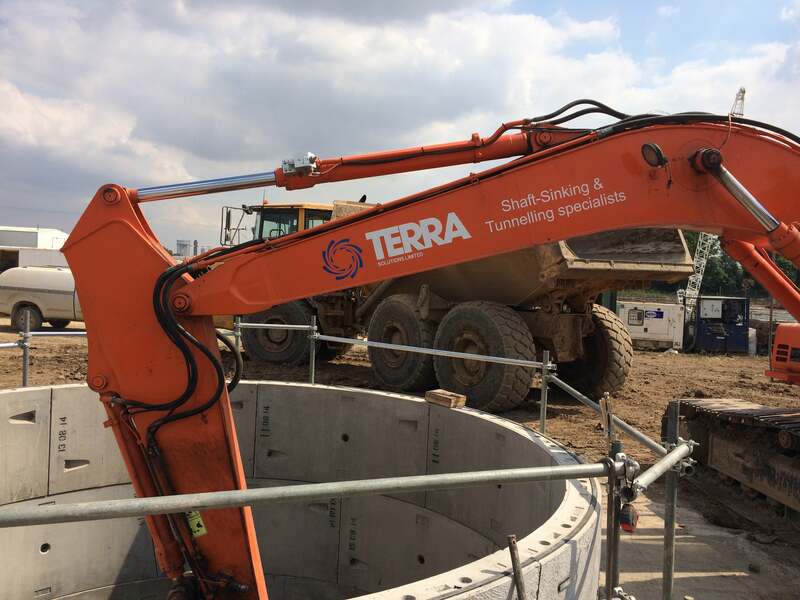 When engaged to install- through shaft sinking- two new structures to serve as Pumping Stations in the town of Goole, England, Terra Solutions were uniquely placed to bring their previous experience to bear on the project. The Capitol Park Spine Road Scheme required the construction of both a storm water and a foul water pumping station to support the expansion of the water network. In challenging ground conditions with boulders and artesian water present in otherwise stiff gravelly clay our Team went to work. The first step undertaken by the Terra team was to excavate a hole of sufficient size around the centre point of the shaft, and excavate down to a suitable level where the cutter choker could be installed and the first ring built on top. When the choker was constructed, the segments were surrounded in polystyrene to create an annulus, so that the shaft could sink independent of the concrete collar. 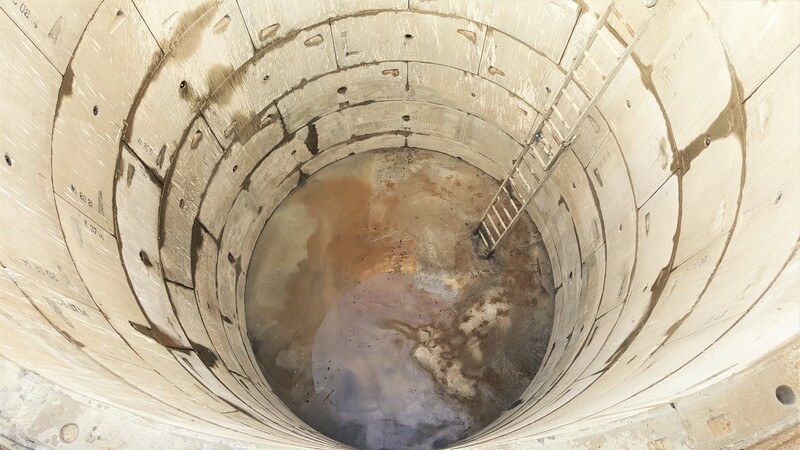 After the collar had been poured, but before it had cured, the team installed hand rails around the top of the shaft, a necessary safety precaution. Then- also before the concrete had cured- threaded bars were installed so that hydraulic jacking rams could be used if the terrain proved more difficult to let the Caisson method sink under its own weight and additional force was necessary. At this point excavation could begin in earnest, with the material being removed from the interior of the shaft in a controlled and methodical manner so that the shaft would sink in a uniform manner. As excavation progressed, the next ring of segments was added on top, and these were all connected using T-bolts, which created one single structure. 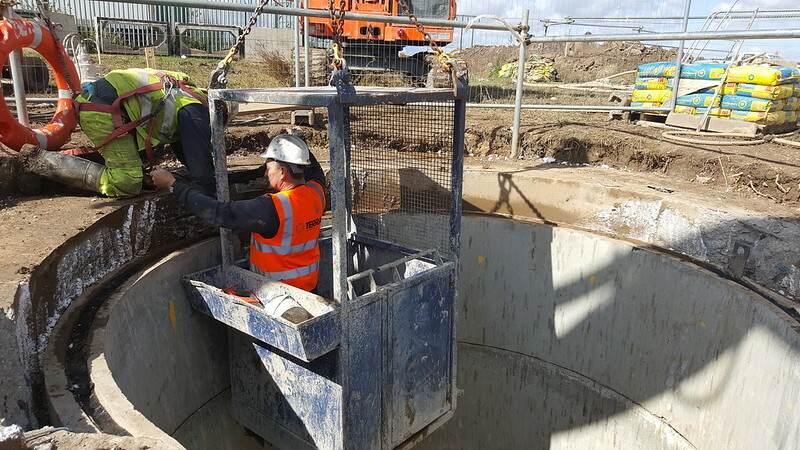 Eventually, the bottom of the shaft was out of reach of our 35T excavator and a hydraulic clamshell arm was fitted so that the required depth could be achieved successfully. Rings (made up of segments of pre cast concrete supplied by FP McCann) were continually built on top, creating the structure and providing the necessary weight for the shaft to keep sinking, this was repeated until the required depth was reached. 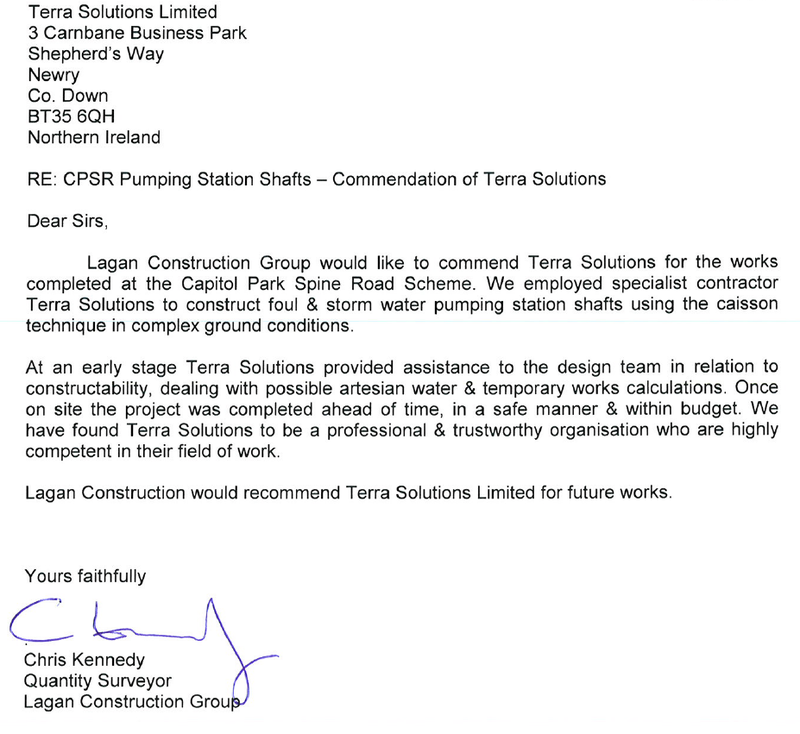 The Terra Solutions 25 Ton Excavator methodically removes spoil from the shaft interior. To ensure a complication-free install, it was necessary to use a bentonite based lubricant to lubricate the outside of the shaft, to reduce the frictional forces acting upon it. This was mixed in a paddle mixer and then pumped in to the annulus. When at the necessary depth, a layer of blinding concrete was poured. After this, the steel necessary to create the base of the structure was hand tied to dowel rods in the rings. The final part of the creation of the base is the pouring of the concrete around the steel to create the reinforced concrete base and make the shaft and the base one single structure. This was done using a 34m mobile concrete pump. The annulus, once filled with bentonite, was then refilled with cementitious grout. This created a permanent barrier with the ground around it and prevents any possible future water ingress. Once this had been completed, it was time for the shaft to be caulked and pointed, so that it was suitable for the client’s needs. The smooth internal surface was created by a member of the Terra team, positioned within a man-riding basket which was operated by a mobile crane. To ensure their safety, this team member was instructed to wear a harness, which was connected to a davit arm at all times. This process was used for the creation of two shafts in this instance, the first of which was 5m diameter and 8m deep, where the other was 3m diameter and 10m deep.